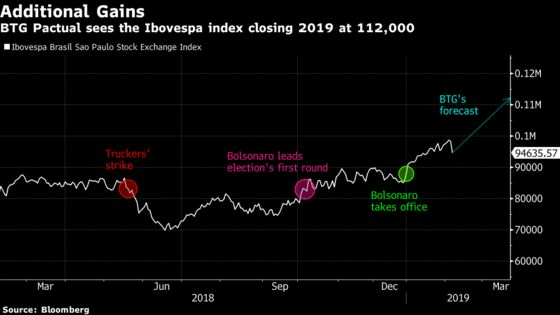 (Bloomberg) -- Brazil is home to the only one major market across the globe where stocks are hitting all-time highs. But calling it expensive might be a mistake. Corporate earnings will continue to grow, Sequeira said, predicting a 16.5 percent increase this year. Brazil and Peru are the most favored markets in the region by BTG Pactual, which recommends investors hold more shares than their representations in benchmarks. The firm rates Chile and Colombia neutral, and Mexico underweight. As Congress returns to work, discussions over pension reform -- a key issue in the administration’s agenda and for investors -- is likely to create market volatility in the short term. Investors expect the pension bill to gain lower house approval in the first half of the year and any delay could spark a sell-off in stocks, he said. What stocks should investors buy in Brazil? 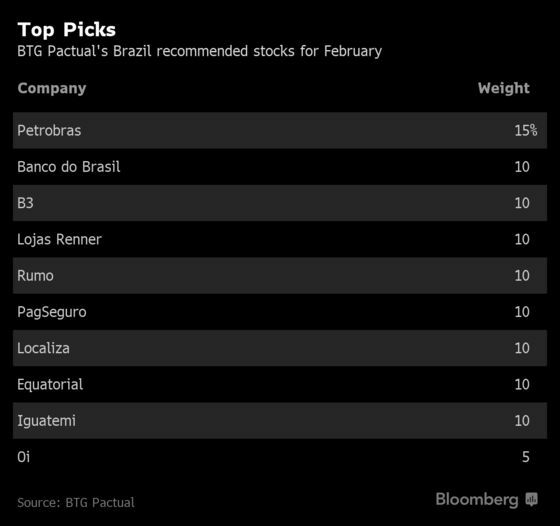 BTG Pactual has been favoring companies reliant on the domestic economy, such as consumer goods producers, retailers and banks. The firm just added PagSeguro, Iguatemi and Equatorial to its list of 10 stock ideas for the month. "There’s room for consumption to grow and families to leverage a bit more," Sequeira said.